I'm Kimberly from Nail Reflections! I hope everyone is having a great day! I'm so Happy to be back here at Amber's for a second time! Barely had time for my Guest Posting Hat to get dusty! Today, I'm keeping the flower theme from my last post. This is a cute and playful mani that you can do. 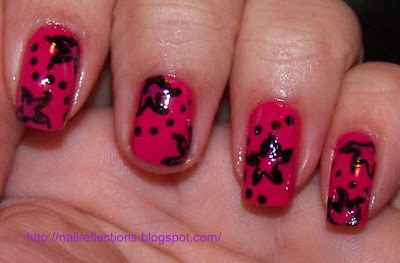 I used Nina - Tutti Fruitti as the base coat and Black acrylic for the flowers. 5 point flowers are really easy to do. Once you get the hang of them. Then you can start playing around with them. Here is another one of my nifty charts! Step one is just dot to center your flower where you want it and your ending point. Step 2 is a slightly curved line into the dot. Step 3 is starting right under the curved tip, tear dropping back to the dot where the first line started. Then fill in the color. 3a 3b show it in color. 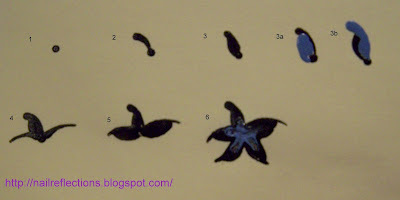 Step 4 and 5 are just filling the other petals. Step 6 is the finished flower. If you do not like your petal shape you can fill them out just kinda redraw outside the line til you like the shape. Once all the petals are done you can dot in the middle and then with a smaller dotting tool or pen pull the dot color into each petal. Don't be afraid to dot the middle again if you need more paint or polish to pull outwards. 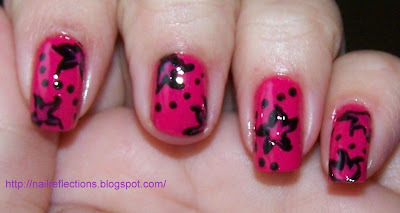 Make sure it is dry and throw on a top coat on. If your using acrylics use a loaded brush and try not to use a heavy hand, some paints will bleed as you pull. Well I hope you enjoyed this post as much as I did! Thanks again for inviting me Amber! Let Kimberly know what you think of those beautiful flowers and try them out for yourself! If you haven't done so yet, you can visit her here to check more of her work. Thanks for stopping by. How are you liking Guest Post week here?